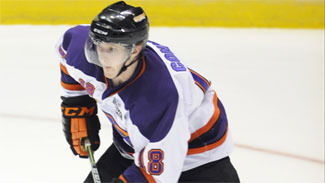 Kyle Connor, who was given an A rating on NHL Central Scouting's players to watch list for the 2015 NHL Draft, is in his third season with the Youngstown Phantoms of the United States Hockey League in 2014-15. Committed to the University of Michigan in 2015-16, the 6-foot-1, 182-pound center has 11 goals and 31 points in 30 games with the Phantoms this season. Connor, who had one assist and three shots on goal in the CCM/USA Hockey All-American Prospects Game on Sept. 25, has offered to maintain a blog for NHL.com leading up to the 2015 NHL Draft in Sunrise, Fla. His latest entry is on his participation in the USHL/NHL Top Prospects Game in Dubuque, Iowa. I'm really excited for the chance to represent the Phantoms at the USHL Top Prospects Game. It's going to be a great opportunity to play with and against the best players around the league. Playing in the All American Prospects game earlier this year will help relieve a little of the pressure in the Top Prospects game since I have an idea what to expect. At any type of event like the Top Prospects game, you may be nervous your first couple shifts but after that you just go play hockey. I'm definitely happy for my teammates who made it with me [goalie Chris Birdsall, defenseman Kris Myllari, forwards Chase Pearson and Kevin Conley] and am looking forward to competing and sharing this experience with them. The season in Youngstown has been good so far for us this year. I think we have made tremendous strides from the beginning of the year to where we are at now (fourth place in Eastern Conference; 17-9-5, 39 points). We are a very close-knit group, and everybody seems to get along.